This is a very alternative interpretation of this card. In it’s original state, the Seven of Wands depictures a man standing up on a hill holding a wand in his hand and battling six more from bellow. It’s a card about having obtain a certain amount of success and position and defending it from the challengers that come from an inferior position. 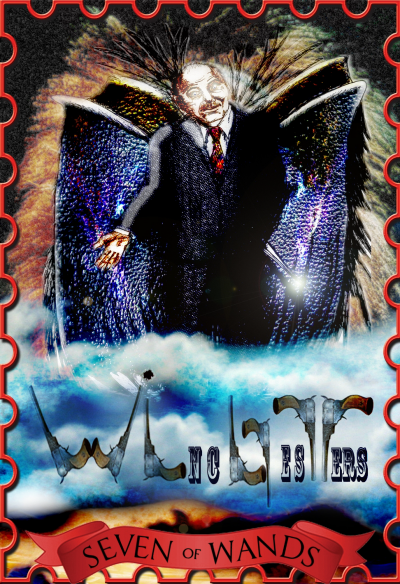 With Zach as the main figure in this card, I figured that if anyone was challenging him, it was the entire Winchester family, while he, and angel, stood above the clouds. The wands, or the Colts in this case, stand for each person on Sam and Dean’s side, family, either by blood or not. The ones pointing up are those still alive (Sam, Dean, Bobby and Castiel); the ones pointing down are those already gone (John, Mary and Adam). The last one, the wand that should’ve been in Zach’s hand, is Adam, who in the end chooses to stand by his family. In his stead, Zach holds an angel sword, hidden from view, in his usual treacherous way.